Sergeant Humberto F. Timoteo, 25, of Newark, New Jersey, assigned to Battery A, 3rd Battalion, 112th Field Artillery, Morristown, New Jersey. 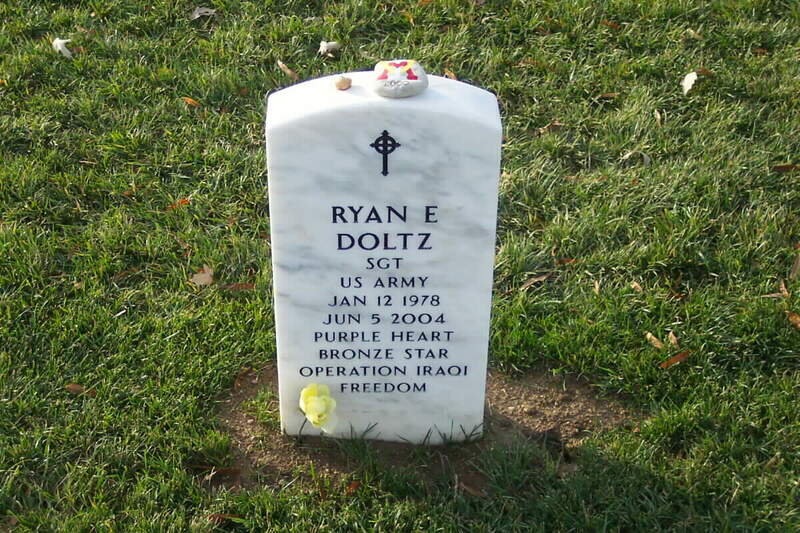 Specialist Ryan E. Doltz, 26, of Mine Hill, New Jersey, assigned to Battery B, 3rd Battalion, 112th Field Artillery, Lawrence, New Jersey. 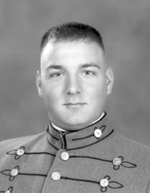 The Superintendent regrets to inform the VMI community of the combat death of Specialist Ryan E. Doltz, VMI Class of 2000, on June 5, 2004, in Iraq. Specialist Doltz was mobilized with the New Jersey Army National Guard's 3rd Battalion, 112th Field Artillery, which deployed to Iraq in February. The unit was retrained to perform military police duties prior to its deployment. He died Saturday when an improvised explosive device was set off. Specialist Doltz was a native of Mine Hill, New Jersey. He matriculated with the Class of 2000, but graduated with the Class of 2002 with a Bachelor of Arts degree in History. He was a member of the Band Company. Many friends of VMI remember him as one of the four cadets featured in the national television commercial filmed at VMI for Norelco in 1998. While attending VMI, Specialist Doltz was a member of the Virginia Army National Guard's Battery A, 1st Battalion, 246th Field Artillery in Martinsville. He earned an Emergency Medical Technician certificate while at VMI, and later qualified for the EMT certification in New Jersey. He was a member of the Mine Hill, N.J., Volunteer Rescue Squad until his mobilization. While at the United States Army Field Artillery Training Center in Fort Sill, OK, Specialist Doltz won the Top Gun Award for military proficiency at section tasks associated with 13B10 training. Among survivors are his parents, Raymond and Cheryl Doltz, a sister, Anne, and brother, Gregory, all of Mine Hill, N.J. Funeral arrangements are to be announced. 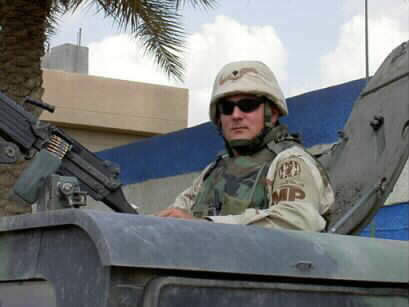 Funeral arrangements have been announced for Specialist Ryan Doltz '00 who died last week. Friends may call at the Tuttle Funeral Home in Randolph, N.J., on Monday, June 14 from 1 p.m. to 9 p.m. A chapel service will be held at the Mine Hill Presbyterian Church in Mine Hill, N.J. on Tuesday, June 15 at 10 a.m. Graveside services will be held on Wednesday, June 16 at the Arlington National Cemetery in Washington, D.C., at 1 p.m. The Doltz Family has requested that VMI provide pall bearers and a bag piper for the service. The family and the VMI Alumni Association are working closely together to create a scholarship fund in lieu of flowers. Please continue to check this site for details. They will be posted as they become available. Monday, June 14, 1 p.m. to 9 p.m., Tuttle Funeral Home, Randolph, N.J.
Tuesday, June 15, 10 a.m., Mine Hill Presbyterian Church, Mine Hill, N.J.
Wednesday, June 16, 1 p.m., Arlington National Cemetery, Washington, D.C. MINE HILL, N.J., June 7, 2004 - For two months, an American Legion blue star has hung in the window of Specialist Ryan E. Doltz's childhood home here, a signal from his family to the world that he was serving in Iraq. Tomorrow, the blue star will be replaced with a gold one. Specialist Doltz, a 26-year-old member of the New Jersey National Guard, was killed in an attack on Saturday on the outskirts of Baghdad. He was one of four soldiers from New Jersey's National Guard Third Battalion of the 112th Field Artillery unit killed last weekend in two separate attacks. His name was not officially released by the National Guard, but his family confirmed his death. On Friday, Sergeant Francis Carvill, 51, of Carlstadt, and Specialist Christopher M. Duffy, 26, of Brick, came under attack shortly after 1 p.m. local time on Palestine Street near the Shiite district of Sadr City. Three other soldiers from the New Jersey National Guard were also injured in that attack. Details about Saturday's attack that killed Specialist Doltz and the other soldier were not released by the military, and officials would not release the name or hometown of the fourth soldier until his family returned from a trip out of the country. They were expected to return home Monday night. All of the soldiers were members of Task Force Baghdad, a group that provided security and drivers to various military convoys, according to Lt. Col. Roberta Nietz, a spokeswoman for the New Jersey Department of Military and Veterans Affairs. The soldiers were the first four members of the New Jersey National Guard to be killed in Iraq and the first to die while serving overseas since World War II. There are approximately 300 guard soldiers from the state serving in Iraq. Police officers from Wharton, N.J., who also serve Mine Hill, were stationed on Monday outside the Doltz's yellow house on a quiet street lined with trees, neat lawns and blooming gardens. A police officer who declined to give his name but said he knew the fallen soldier held a framed photograph of Specialist Doltz taken before his 2002 graduation from Virginia Military Institute. "This is the photo the family wants everyone to see," the officer said. "It was Ryan's proudest moment." But at the Mine Hill volunteer rescue squad building where Specialist Doltz worked for more than two years as an emergency medical technician, Capt. Edna Deacon of the rescue squad remembered the soldier as "a strong, dedicated, delightful and gun-ho young man who made everyone he knew extremely proud.'' She said Specialist Doltz had aspirations to become an Army helicopter pilot and medic. Her husband, Jack, who is the president of the rescue squad and who worked at the Picatinny Arsenal as a weapons expert for 37 years, said he spent hours talking about weapons and the military with Specialist Doltz. "He would send me pictures from Iraq of weapons they confiscated and asked me all about them,'' Mr. Deacon said. Specialist Doltz was the first soldier from Mine Hill, a town of about 3,700 in Morris County, killed since the Vietnam War, according to town officials.Captain Deacon said Specialist Doltz worked for the rescue squad with his younger brother, Gregory, a gardener, who planted a floral arrangement in front of the rescue squad building to resemble the American Legion blue star that hangs in the window of the rescue squad building and the one at Specialist Doltz's home. Capt. Deacon said that the blue flowers making up the star would also be changed to gold. MINE HILL, NEW JERSEY -- Ryan Doltz was remembered by his family Tuesday as a man full of life and mischief, someone who gladly accepted challenges and was so dedicated to his Morristown-based National Guard unit that he shook off two broken heels to join his fellow soldiers in Iraq. Army Specialist Doltz, 26, was one of four members of the 3rd Battalion of the 112th Field Artillery killed in combat last weekend. He was the second Morris County resident to die in combat in Iraq. His unit was called to active duty last year and Doltz arrived in Iraq on Good Friday. "He was a true citizen-soldier," said his mother, Cheryl Doltz, at a news conference outside the Mine Hill Municipal Building Tuesday afternoon. 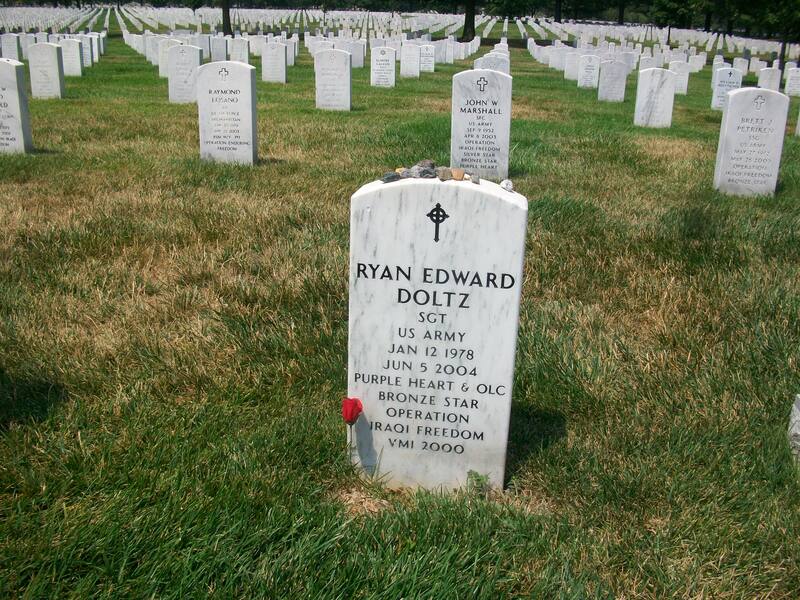 "Ryan Edward Doltz was an American patriot in the truest sense of the word. He was willing to put his own hopes and dreams on hold because he felt that his country needed him. "He never wavered in his devotion to his country, his family and his alma maters, Dover High School and the Virginia Military Institute. He will be sorely missed by his family, friends and Brother Rats of the VMI Class of 2000." In their first public statements since learning of their son's death Saturday, the Doltz family thanked the Mine Hill community, the New Jersey National Guard and friends for their support. "Mine Hill is a community like no other in the world," Cheryl Doltz said, citing among other efforts, the work that 40 or 50 community members performed on the driveway and front lawn of the Doltz home Monday night. Ernest Fraser of Mine Hill was one of those volunteers. He said members of the local fire, police and rescue squads, other residents and a crew from the Meier Stone Co. of Mount Olive laid a walkway and landscaped the yard, because they felt the need to help. Ryan Doltz was a certified emergency medical technician and a member of the Mine Hill First Aid Squad since 2002, when he returned from Virginia, where he also had been a certified EMT. At the time of his recent deployment, he was working in New York for MoreTrench American Corp., the engineering firm that built the slurry wall at the World Trade Center . Cheryl Doltz said the family will establish a scholarship fund in their son's name. Details will be released later, she said. 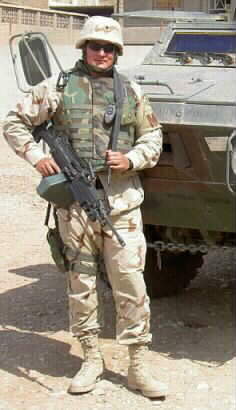 Doltz and Sergeant Humberto Timoteo, 25, of Newark were killed Saturday when a roadside bomb hit their armored vehicle. Their unit was providing security for a convoy when they were killed. "The loss of a single soldier is difficult to the National Guard family and community," said Lieutenant Colonel Roberta Niedt, a National Guard spokeswoman. "It is inconceivable that we have had to face this many deaths in such a short period of time." Two other members of the unit, Sergeant Frank Carvill, 51, of Carlstadt, and Specialist Christopher Duffy, 26, of Brick, were killed Friday in an ambush. Three other soldiers from the unit were injured in Friday's attack. The first Morris County casualty in Iraq was Marine Second Lieutenant John Thomas "J.T." Wroblewski of Jefferson, who was killed in April. He was buried at Arlington National Cemetery. Cheryl Doltz said she received a telephone call from the Wroblewski family. Services for Doltz are pending, family members said. Doltz was the third VMI graduate to die in Iraq since October, said college spokesman Lieutenant Colonel Stewart MacInnis, who said he spent Monday contacting VMI alumni with news of Doltz's death. Greg Doltz said his brother lived for the ideals represented by the VMI cadet training and the military code of honor, service, respect and truth. "He followed his dream," Greg Doltz said. Television watchers were given a glimpse life at VMI in 1998 when Norelco filmed a shaver commercial at the school using four cadets, including Doltz, MacInnis said. His mother recalled the commercial. "Friends will remember him as 'Babyface' from a closing scene in a 1998 Norelco commercial he filmed with other cadets from VMI," she said. 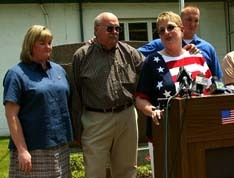 Wearing a red, white, and blue American flag jersey, Doltz's mother spoke for the family during the two-hour news conference, supported by Greg, his girlfriend Tiffany Kusen, daughter Anne, her husband Raymond, and his sister and her husband, Carole and Bill Waple of Marlboro. While seated at the dais in the Mine Hill courtroom, the family members linked arms or clasped hands as they spoke. Memories of her son brought both laughter and tears to Cheryl Doltz's voice. Her husband, Raymond, did not speak, his face at times wrinkling into grief. "It is still impossible to believe that Ryan wouldn't come walking through the door wearing his favorite cowboy boots, black Stetson and a big grin on his face," his mother said. "His blue eyes sparkled with mischief whenever he could get his brother in trouble." Cheryl Doltz, a fifth-grade teacher at East Dover Elementary School, said her colleagues are covering her classes through the last two weeks of school. She said Ryan was a frequent visitor to the classroom and made a big impression on her students. John Smarth, 17, now attending Dover High School, said he had Cheryl Doltz as his teacher for both kindergarten and sixth grade. He said he met Ryan Doltz several times when he came to class to tell stories or just to say hello, "because that was the kind of person he was." Smarth said he was devastated when he heard Saturday that Doltz had been killed and that the death was a "great loss for the Mine Hill/Dover community." "From what I have seen of Ryan, he was a caring, thoughtful, outgoing, all-around nice guy," Smarth said. "Ryan dedicated his life to helping others no matter what. If there was a problem and he knew about it, he would do whatever he could to make it better." For the Doltz family, the times of Ryan Doltz's life spilled together to create a picture of a man-child in love with life, reaching out, testing the limits: As a boy playing military games in the middle of the night with Greg and just escaping when the police came; talking his way out of a speeding ticket he got for driving 85 mph on his way to the start of classes at VMI. They remember him deciding to attend a state military college and joining the Virginia National Guard so he could pay in-state tuition and not the $17,000 charged to out-of-state students; choosing a history major after trying biology and physics and being asked by a senior cadet if his goal was to learn physics or to graduate; taking up rugby -- "football without pads," his mother said -- after dropping his attempt to make the VMI football team; deploying with the Virginia National Guard to watch over chemical weapons in Maryland as the unit's duty for homeland security; using his rehab wheelchair to perform wheelies in the living room; debating politics with anyone who would engage. "He loved the excitement of Washington politics," Cheryl Doltz said. He said he wanted to run for mayor of Mine Hill, a stop on his way to Washington, she said. "He might not have been a good president, but he would have made a great senator," she said. The mother of slain National Guard Specialist Ryan Doltz remembers hearing her son say he did not think he would survive his tour of duty in Iraq. "I believe in premonitions. At first I just waved my hand and said he was crazy," Cheryl Doltz said at a news conference Tuesday. "But now, it seems he knew all along that he would not come home." Doltz, 26, was killed Saturday when a Humvee he was driving ran over a bomb in Sadr City, a section of Baghdad. He was one of four New Jersey National Guardsmen from the same unit to die in attacks in Iraq last week. Friends and family remembered Doltz as a lover of life and its challenges and an idealist who put his own hopes and dreams on hold because he felt his country needed him. "He never wavered in his devotion to his country, his family and his alma maters, Dover High School and the Virginia Military Institute," his mother said. "He will be sorely missed by his family, friends and Brother Rats of the VMI class of 2000." Doltz, who is survived by his parents and a brother and sister, joined the Virginia National Guard so he could pay in-state tuition at VMI. After 9/11, he deployed with the Virginia Guard watching over chemical weapons in Maryland, then transferred to the New Jersey unit in 2002. He had been working in New York for an engineering firm that was rebuilding a wall that was the last remnant of the World Trade Center towers. A certified medical technician, he had been a member of the first-aid squad in Mine Hill, a Morris County community of 3,700, since 2002 when he returned from Virginia. Doltz injured both heels in a military training accident and missed his unit's deployment in January, but made a quick recovery and shipped out to Iraq in February. Cheryl Doltz remembered how her son loved to push the envelope. He once talked his way out of a speeding ticket on his way from New Jersey to start classes at VMI. He quit the VMI football team only to take up rugby -- "football without pads," his mother said. He was chosen along with three other cadets to appear in a Norelco shaver television commercial that aired during numerous sports telecasts in 1998. Friends will remember him as "Babyface" from a closing scene in the commercial, his mother said. A former student of Cheryl Doltz's at East Dover Elementary School remembered times when Ryan would stop by to visit the class and tell stories. "He was a caring, thoughtful, outgoing, all-around nice guy," said John Smarth, 17. "Ryan dedicated his life to helping others no matter what. If there was a problem and he knew about it, he would whatever he could to make it better." Cheryl Doltz said the family will establish a scholarship fund in their son's name. Wharton (New Jersey) police and the state Department of Transportation will block off a section of Route 46 on Tuesday while the church service for Army Specialist Ryan Doltz takes place at the Mine Hill Presbyterian Church. Randolph police and the state made similar arrangements for Route 10 in Randolph for Monday, near the Tuttle Funeral Home, when the viewing is under way. Visitation will be from 1 to 9 p.m. Monday at the funeral home. A chapel service will be held at the Mine Hill Presbyterian Church on Route 46 at 10 a.m. Tuesday. A graveside service will be held at 1 p.m. Wednesday at Arlington National Cemetery in Washington, D.C.
Doltz, a member of the Morristown-based 3rd Battalion, 112th Field Artillery National Guard unit, was killed in Iraq on June 5, one of four soldiers from that unit who died last weekend. The Doltz family is establishing two scholarships in his name, one at Virginia Military Institute and the other at Dover High School. The VMI scholarship will benefit a cadet in the band company, according to the school's Web site. Gifts made to the VMI Foundation in Doltz's memory will be used to establish the Ryan Doltz '00 Scholarship. To contribute to that scholarship, checks should be made out to the VMI Foundation, with a notation that the gift is in memory of Ryan Doltz. Online donations can be made through the foundation Web site. Checks should be sent to: VMI Foundation, P.O. Box 932, Lexington, Virginia 24450. Randolph Police Lieutenant Michael Pisano said that, on Monday, the right travel lane of westbound Route 10 will be closed beginning at South Morris Street past the funeral home. Visitors to the funeral home should plan to use its rear entrance on Quaker Church Road, one block north of Route 10. Parking will be allowed on side streets in that area, Pisano said. Randolph police officers will be stationed along Route 10 and Quaker Church to direct traffic, he said. Pisano said the 5 p.m. to 7 p.m. rush hour is a concern because both Route 10 and Quaker Church Road see considerable traffic during that time. Wharton Police Chief Anthony Fernandez said Route 46 in Mine Hill will be closed Tuesday at 9 a.m. between Randolph Avenue and Canfield Avenue during the church service. The detour will end after the service, which is expected to last about two hours. Traffic will be detoured down Canfield Avenue to Randolph Avenue. The road loops back to Route 46. Parking will be available near the church on Route 46 and at Fireman's Field in the municipal complex on Baker Street. Police officers will be on the scene to direct traffic and help pedestrians cross Route 46, Fernandez said. The man who was known as a rambunctious child, an inventive prankster, a dedicated college cadet and a willing soldier who gave his life in service to his country was buried on Wednesday with military honors. 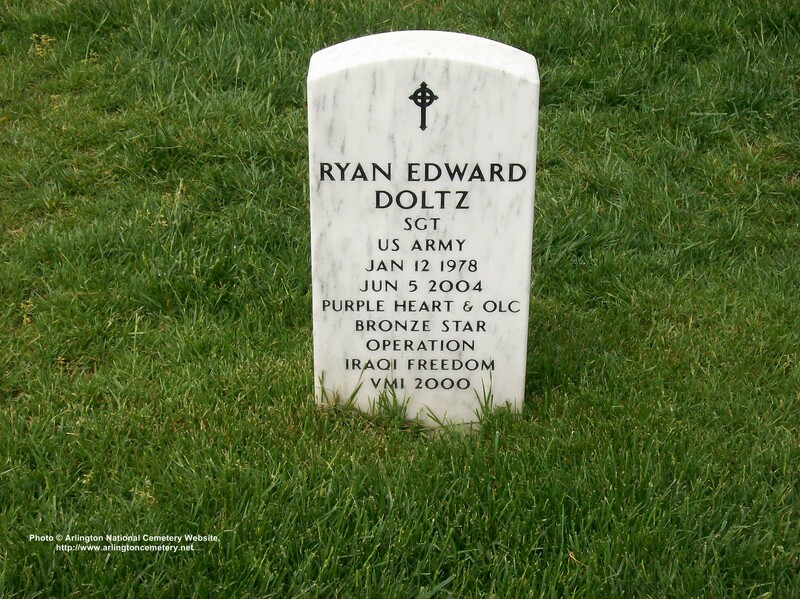 In a field with two small evergreens and before countless rows of white grave markers, Army Sergeant Ryan Doltz was buried at Arlington National Cemetery. The Doltz family - mother Cheryl, father Ray, brother Greg and sister Anne - were supported by more than 300 friends, family members, Mine Hill residents and members of the military. The latter included a cadet corps from Virginia Military Institute, Doltz's alma mater, and the New Jersey National Guard, in which he was serving at the time of his death. Cheryl Doltz said it was her son's dream to be buried at Arlington National Cemetery. "It was a beautiful service," she said. "It was more than I expected, and one that would have made Ryan proud." The family was stunned and pleased by the turnout, she said. Military officials told her it was one of the largest gatherings for a funeral at Arlington, she said. "We were asked, 'Who are you? You must have some pull,'" Cheryl Doltz said. "But I said, 'No, Ryan was not an officer, just an average person.' To be handed his medals by a brigadier general was something." The large gathering did, she said, reflect the kind of life he led and the impact that he had on people. He was a dedicated soldier and a great man, Cheryl Doltz said of her son. Speaking from a Washington-area hotel following the funeral, she said was amazed by the turnout, particularly that of VMI graduates. She said the cadets had joined the family to tell stories about Ryan Doltz. "They were coming up and saying, 'I'm in the Class of '64, or the Class of '57, and I had to be here,'" she said. The support from mourners helped the Doltz family through the day, she said. "But now comes the hard part," she said. During normal times, Ryan Doltz was either away at school or at National Guard training. The holidays and his birthday will be difficult, his mother said. Cheryl Doltz said VMI gave the family copies of a 1998 Norelco commercial filmed at the school in which Ryan Doltz appeared. It shows him young and active, as he really was, she said. "It will help us remember the good times," she said. Three members of New Jersey's congressional delegation attended the funeral service: Democratic Sens. Frank Lautenberg and Jon Corzine and U.S. Rep. Rodney P. Frelinghuysen, R-Harding. Doltz, 26, a member of Battery B, 3rd Battalion, 112th Field Artillery, stationed in Lawrence, was one of four New Jersey National Guardsmen to die in Iraq on June 4 and 5. Sgt. Humberto Timoteo, 25, of Newark, assigned to a Morristown National Guard unit, who was called up in January when Doltz broke both his heels, died in the same June 5 attack that killed Doltz. Timoteo's death was marked with a moment of silence at Doltz's church service on Tuesday. Mine Hill First Aid Squad officer Edna Deacon, in attendance at Arlington with 10 of the squad's 14 members, said the service was "a fitting tribute for the sacrifice Ryan made." Doltz was a certified emergency medical technician with the Mine Hill first aid squad and was well known to its members. His brother, Greg, also serves with the squad, and their father is a former Mine Hill fire chief. Deacon said the large attendance by the Mine Hill squad was possible thanks to help from the Dover and Wharton first aid squads, which covered Mine Hill for the day. After 10 days of emotional community turmoil that began with news of Doltz's death and continued this week with the death of well-known school crossing guard Ann Bourdette, Deacon said it is time to draw back. The Arlington ceremony helped bring events to an end, she said, but the impact will linger for some time. Mayor Richard Leary, one of more than 100 Mine Hill residents to travel to Arlington Wednesday, said the ceremony recognized the sacrifice that Doltz made for his community and country. The large number of residents at his graveside, and the contingent of rescue, fire and police officers, led by Wharton Police Chief Anthony Fernandez, was an indication of how strongly the community feels about Doltz's death, Leary said. "It is hard to put into words the impact of his death on his family and the community," Leary said. At a church service on Tuesday, Leary said Mine Hill lost a special citizen from a special family. Doltz was remembered at services over the past 10 days as a free spirit who found challenging ways to test the boundaries of life, and a big man who lived life fully. His college classmates told of the time that he led the raid to steal a Jeep belonging to the commandant at the Citadel, a VMI football rival whose annual football game sparked such pranks. The Jeep later was presented to the Citadel officer at the game. They also told of the time that Doltz led VMI cadets to steal a U.S. Naval Academy boat during a rain-cancelled football game. But they also told of the cadet who, while struggling to succeed academically, remained loyal to his friends. Mostly, however, friends and fellow soldiers told about Doltz's love of his country, dedication to service, intelligence and bravery. Doltz broke both heels in a training accident in January, but pushed himself through rehabilitation so he could join his unit, which had been sent to Iraq. Doltz arrived for duty there on Good Friday, April 9. That was two weeks before the April 23 Arlington National Cemetery service for Marine Lt. John Thomas "J.T." Wroblewski of Jefferson, Morris County's first casualty in the Iraq war. Doltz was the second. On Wednesday, the quiet of the Doltz service was swallowed by the greater silence of the national cemetery. The Doltz family walked slowly behind their son's flag-draped casket to the graveside, past a line of mourners, some standing three and four deep. At graveside, the uniformed casket team stood at attention as the chaplain, Army Maj. Douglas Fenton, performed the service. Four VMI cadets stood alongside as an honor guard. During Doltz's service, the crack of 21 rifle shots and the sound of a distant, wavering bugle sounding taps from one of the 25 military services held on Wednesday could be heard. As Fenton concluded the ceremony, the seven-member firing team for Doltz's funeral fired three rounds in his honor, the sound echoing as it rolled away through the soft hills of the national cemetery. A solitary bugler, standing apart from the mourners, played taps before the silence fell again. Slowly, the casket team folded the flag that had draped the casket, pulling it tight, corner to corner, passing it to the team's leader. The leader pulled at the edges of the flag, now in a tight triangle, and it was passed hand to hand down the line to Brig. Gen. Glenn K. Reith, adjutant general for New Jersey. Kneeling before Cheryl Doltz, the general spoke with her for a moment and presented her with the flag. Then, one-by-one, Reith presented her with the Bronze Star, the Purple Heart and the Good Conduct Medal awarded her son. Passing the medals to Reith was Army National Guard Spc. Mike Scuzzese, who served in Iraq in Doltz's unit and spoke at his church service on Tuesday. Members of the Doltz family placed long-stemmed yellow roses on the casket. The grieving family then accepted the condolences of mourners, including Navy Lt. Joseph Klapatch, Doltz's cadet officer at VMI, as well as Lautenberg, Corzine and Frelinghuysen. They were left with a brown patch of earth, a casket to be lowered into the ground, final farewells, and the fulfilled dream of their son, who now rests with his fellows at arms. Cheryl Doltz said the family today will visit some graves of other soldiers buried at Arlington at the request of their families. It is something she said they are glad to do. "I know that Ryan is being watched over," she said. The military was life for Sergeant Ryan Doltz, 26, of Mine Hill, New Jersey, something he lived and breathed, something he believed in. He attended Virginia Military Institute and joined the New Jersey Army National Guard. 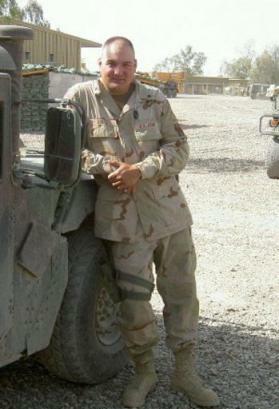 When the call came for his unit to go to Iraq, he went, even though heel injuries had threatened to keep him stateside. "He loved the military. He always wanted everything military," said his mother, Cheryl Doltz. "It only seemed fitting that he be buried at a military cemetery." Her son was laid to rest yesterday at Arlington National Cemetery, two weeks after being killed in Baghdad's Sadr City with another member of the National Guard's 3rd Battalion of the 112th Field Artillery. 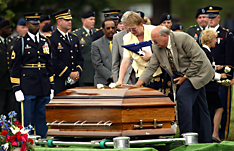 He and Sergeant Humberto F. Timoteo, 25, of Newark died June 5, 2004, in a roadside bombing. Under cloudy skies, scores of New Jersey National Guard soldiers and VMI cadets lifted their hands in salute to Doltz, the 68th casualty of the Iraq war to be buried at Arlington. The funeral party was a sea of uniforms, and the cortege comprised countless cars and five buses. Both U.S. senators from New Jersey were there. Doltz, a Specialist who posthumously was given the rank of Sergeant, had political aspirations of his own. He had said he wanted to run for mayor of Mine Hill, a town of 3,700 about 35 miles west of New York City, and the words "President of the United States" had passed his lips on occasion. He thought he could make a difference, his mother said. After his graduation from VMI and a stint in the Virginia National Guard, he returned to his home town, where he and his brother, Greg, 25, were members of the volunteer first aid squad there. His sister, Anne, is 31. Doltz kept in touch after he shipped out to Iraq. He would call home once or twice a week, usually after he returned to base from a mission. "We're doing the right thing," he would tell his family. "This is where we should be." In his view, many of Iraq's problems could be traced to teenagers, whom he saw as troublemakers. He wanted to make an impression on the next generation. "If we can convince them that what we're doing was right, it will change everything," his mother recounted him saying. He carried candy around Baghdad and distributed it to children, hoping they would see Americans as their friends and not their enemies. If Doltz called and no one was home, he wouldn't leave a message, but caller ID always tipped off his mother. He had called on June 4, she said. Two members of the New Jersey National Guard had been killed that day, and Cheryl Doltz later realized that he had called to let her know he was okay. The next day brought worse news, however, and Cheryl Doltz said she knew it the moment she saw the chaplain and military officer at her door. At the burial, she and her husband, Raymond, sat with the rest of their family in chairs covered in crushed green velvet. After remarks by a chaplain, seven riflemen fired three volleys into the air. The Adjutant General of New Jersey, Brigadier General Glenn K. Reith, knelt near Cheryl Doltz and presented her with the flag that had draped her son's coffin, as well as testaments to his service, a Bronze Star and a Purple Heart. Most of the funeral party left Doltz's grave site shortly after the presentation, but his family remained for a few moments before the coffin was lowered. Picatinny Arsenal honored an Army National Guardsman's service by naming a software engineering center after him at an emotional ceremony Tuesday. It was the first time a New Jersey building was named for a serviceman or woman serving in Iraq. The honor for Sergeant Ryan Doltz, 26, of Mine Hill, came after he was posthumously awarded a Bronze Star and Purple Heart and more than a year after he was killed in Baghdad, Iraq, when the vehicle carrying him back to his base from a combat operation struck a roadside bomb. "I think it's wonderful," said Doltz's mother, Cheryl, who spoke at the building's dedication Tuesday. "He would really like this." Constructed in 1930, The Sergeant Ryan E. Doltz Software Engineering Center was rebuilt in 2001, after it was designated as the site of a new software engineering center for the arsenal. Cheryl Doltz uses humor to recall her son's life. "He was hard to describe — most people would think in terms of his size," the Morris County resident said of her 6-foot, 6-inch, 250-pound son. "Ryan played the tuba, which was perfect for him because he was big enough to handle it." Although Ryan Doltz was never employed at the arsenal, the base decided to name the building after the Mine Hill resident because he was "close to us and the community," said Frank Misurelli, public affairs specialist for the base. "There are people in the building that were friends of his and were with him in Iraq," Misurelli said. Cheryl Doltz said it was fitting that a building used by the arsenal to design new software be named in her son's honor. "He loved computers and he loved being in the artillery," she said. Ryan Doltz was assigned to Battery B, 3rd Battalion, 112th Field Artillery in Lawrenceville. 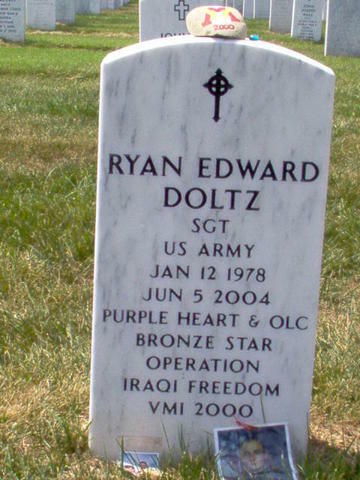 Killed in Baghdad on June 5, 2004, Doltz was posthumously promoted to sergeant. Buried at Arlington National Cemetery, he is survived by his parents Raymond and Cheryl Doltz, his sister Anne, 32, and brother Gregory, 26. Doltz graduated from Dover High School, where he played noseguard for the football team. He then went to Virginia Military Institute, where he received a bachelor's degree in history in 2002. "He switched to rugby there because it was football without pads," his mother recalled with a laugh. "We always said he went down to Virginia listening to Metallica and came back wearing a cowboy hat and boots, listening to country music." A former teacher, Cheryl Doltz also remembered how her son helped chaperone her classes' field trips to New York City. "He would always request the toughest kids," she said, "He would usually have four or five boys lined up, and he'd keep them right in line." While he was training to go to Iraq in 2004, Ryan Doltz fell and broke both of his heels, Cheryl Doltz said. "He wanted to be sent to Iraq with the people he knew," she said. "He was determined to get back with his own unit and in early April, he convinced them he was healed enough." The Doltz family has established two scholarships — one at Dover High School and one at Virginia Military Institute — in honor of their son. 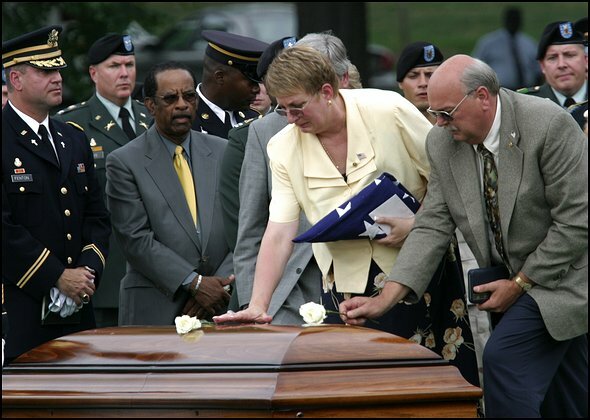 ROXBURY -- Cheryl Doltz will never forget June 5, 2004, when she heard the knock on the door that every military family dreads. "All I saw was a cross on a chaplain's collar, and I knew my son was never coming home," Doltz, of Mine Hill, told a full assembly of Roxbury High School students during a Wednesday Veterans Day ceremony at which she was the keynote speaker. Cheryl's son, Sergeant Ryan Doltz, 26, a member of the New Jersey Army National Guard, was killed in Iraq by a roadside bomb, a deadly device that has claimed scores of military lives there -- including Marine Pfc. Donald Brown, 19, a 2005 Roxbury graduate who was killed late last month in Haditha. Wednesday's ceremony was dedicated to Brown, whose smiling face was displayed on a large overhead screen. Brendan Donegan, one of his teachers, told the crowd of Brown's athleticism and desire to be part of a team, as well as his playful, goofy side that sometimes got him in trouble with teachers, but he'd always own up to it. None of the Browns attended, but Donald's fiancée, Megan Robinson, of Mount Olive, tearfully received a plaque in Brown's honor. Doltz, who started her address by thanking the more than two dozen veterans on stage, was introduced by John Aslanian, a foreign language teacher at the school, and a fellow Army National Guardsman who was deployed with Doltz to Iraq. "She has made one of the greatest sacrifices one can make for her country," Aslanian said. "She gave us one of her most precious gifts, her son." Doltz illustrated that by wearing a Gold Star pin and displaying the small Gold Star flag she hangs on her front window. "It shows that I'm a member of a very special club," she said. "Each of us would give anything not to be a part of this select group." Doltz said the small white flag with red trimming and gold star in the center symbolizes that the family that lives where the flag hangs has lost someone during war. "It has been hanging there for over two years," she said, her voice trembling. "It will remain there until our country is no longer at war," she said. Doltz eloquently spoke of her son and how he joined the National Guard while attending the Virginia Military Institute to ease his parents' financial burden. She unfurled a quilt that bore several picture patches of her son during various phases of his young and short life. She said that Ryan was the kind of student teachers either loved or dreaded, that her son enjoyed skiing, was a black belt in karate, and that she remembered him "giving me gray hair when I tried to teach him how to drive." He learned every play for every position for his high school football team just in case he was needed for any one of them, Doltz said. "He always dreamed of making that winning touchdown,"Doltz said. "That was not in the cards for him." She explained how the military helped her family get through the process of receiving their son from Iraq and burying him in Arlington National Cemetery. A helicopter even flew over the burial service. "Ryan had always wanted to be a helicopter pilot," she said. Students, both before and after Doltz's address, read war-related poems and letters from conflicts ranging from the Revolutionary War to the first Iraq War, and the sacrifice involved in each. No letter illustrated that more than a letter written by Abraham Lincoln to Lydia Bixby, a widow believed to have lost five sons in the Civil War. "I feel how weak and fruitless must be any words of mine which should attempt to beguile you from the grief of a loss so overwhelming," student Ariann Nuetts read. "But I cannot refrain from tendering to you the consolation that may be found in the thanks of the Republic they died to save. I pray that our Heavenly Father may assuage the anguish of your bereavement, and leave you only the cherished memory of the loved and lost, and the solemn pride that must be yours to have laid so costly a sacrifice upon the altar of freedom." Film clips from such movies as "The Patriot,""Glory," and "Saving Private Ryan" were played to illustrate the courage it takes to join the military and the sacrifice one must make in serving their country. Several of the veterans who sat on stage during the ceremony were from Roxbury, including, among others, school board member Bob Badini, substitute teacher and former councilman Ed Kirchgessner, Municipal Court Judge Carl Wronko, and retiring social studies teacher Anthony D'Amelio. D'Amelio, who served in the Army National Guard during the Vietnam War era, began posting along an upstairs high school hallway wall large poster boards that had names, ages and short biographies of the service members who died while serving in Iraq and Afghanistan. What started out as a one or two bulletin-board sized posters expanded to seven. The walls also contained articles about the fallen New Jersey service members, including, most recently, Brown. Ted Koutsoubas, 16, a junior, who's helping D'Amelio with the wall project, said it's meant to remind students of those who have lost their lives. "I feel that people should remember all those who passed away, and their memory should live on," he said. "It doesn't matter what side of the political spectrum you're on. You have to honor the memories of the fallen soldiers." As for the Veteran's Day ceremony, Koutsoubas said it was different from any kind he's ever witnessed. "I almost started crying during the ceremony, actually," he said. "It truly is a highlight of Roxbury High School." The reminders of Sgt. Ryan Doltz are everywhere for his mother Cheryl. But they're not necessarily what you'd expect. Sure, there's the faded gold star in the window of the family's Mine Hill home, commemorating the 26-year-old National Guardsman who died in a roadside bomb attack in Iraq nearly three years ago. The Picatinny Arsenal military software engineering building, named in his honor. The memorials at Dover High School, the Virginia Military Institute and Arlington National Cemetery. The things that really make Doltz think of her son, though, are the funny little snafus that seem like things Ryan -- a grinning, 6-foot-5 trickster -- might have arranged. Like the time Whiskey, one of the family's two rescued greyhounds, got into the display of Ryan's memorabilia and "decided medals taste good," Doltz said. 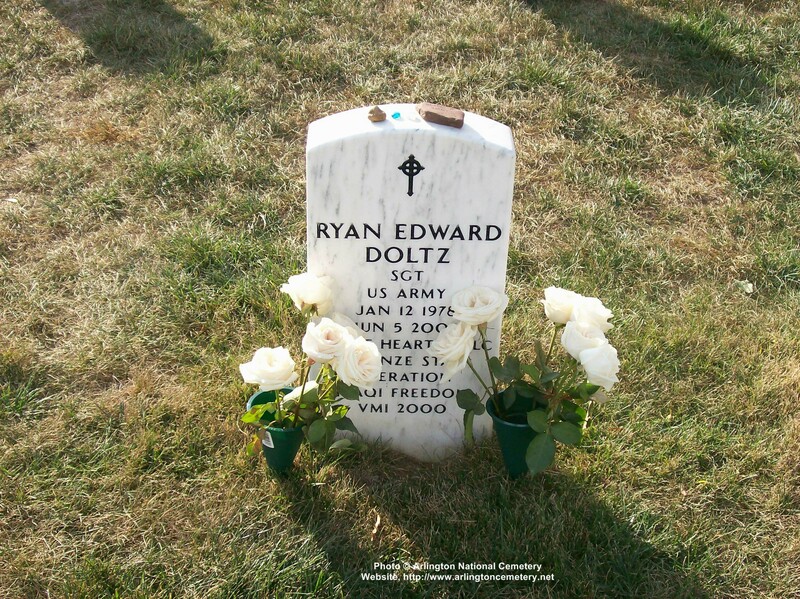 Then there is the Ryan E. Doltz Memorial Foundation, which helps families of wounded soldiers and awards college grants. At least one scholarship each year goes to a Dover High School graduate. Another goes to a student at Virginia Military Institute, where Ryan was a proud member of the institution's last all-male class. This year's VMI scholarship winner is Christopher Rau, a towering young tuba player who keeps running afoul of the institute's strict rules and is "so like Ryan," according to Doltz, a retired Dover schoolteacher. The next scholarship fund-raiser will be an August 19, 2007, motorcycle "Run for Ryan" sponsored by the Knights of Fire. More information is at www.knightsoffire3nj.com. Doltz can laugh as she recalls her son's mischievous ways. But she also finds much-needed solace in knowing his memory lives on in the scholarships and memorials that bear his name. "He'll never be forgotten," Doltz said. "Long after we're gone, those things will still be there. His service won't be forgotten." family, Monday, June 7, 2004.
a photo released by his family, Monday, June 7, 2004.